Mrs Markham, the mother, takes in washing, and on Tuesday morning had gone to Little Glemham after some linen. [Another] woman left at home had put some boiling water into a small tub standing on the ground in the yard: [Charles] and his sister were blowing bladders [used for footballs], and on stepping backwards he fell into the water. Other domestic hazards are also evident in this illustration: clothes drying by the fireside, the candlestick on the dresser in reach of small children. Illustrated Police News, 30 December 1882. There are similar accidents recorded in coroners’ inquests and newspapers around the country. 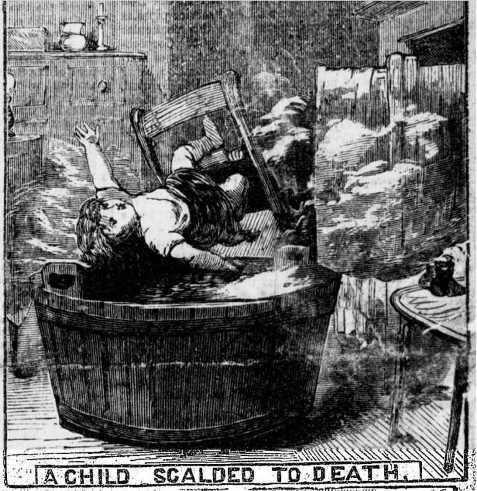 In 1882, the Illustrated Police News reported on the death of Emma Dixon, “left by [her] mother for a few minutes, the mother having gone out on an errand. It appears that the child was left seated in a high chair, which must have toppled over, for upon the mother’s return the poor little thing was found immersed in a tub of hot water. It was so severely scalded that but faint hopes are entertained of its recovery.” Yet, such accounts remain surprisingly infrequent in comparison to other domestic accidents. on Saturday evening, [she] went out, leaving the deceased lying on the hearth before the fire. There was a chair standing by the fire with some linen on it. She was not absent more than five minutes, and when she came back the child’s clothes were on fire, as also the linen on the chair. It was supposed that the back door being open, the wind blew the linen into the fire, which ignited and set fire to the clothes and burned the child. Ipswich Journal, 16 Apr 1853, p. 2. Ipswich Journal, 22 Jul 1854, p. 3. Illustrated Police News, 30 Dec 1882, p. 1. SROi EC5/8/30 Inquisition at the parish of Saxmundham on the body of Harry George Self, 6 Nov 1865; Ipswich Journal, 11 Nov 1865, p. 5. Ipswich Journal, 24 Sept 1892, p. 5. Sambrook, ‘Childhood and sudden death’, p. 235.